Thank you very much for your kind donation. I really appreciate your support. You are welcome to come to one of the launches of the App in Byron Bay or Sydney. I'd love to see there. Wow, thank you. This pledge is either a straight donation or it will give you access to the Student Area on the HSC English Hub App after the user downloads it. You will be issued with a code once the App is published. You are welcome to come to one of the launches of the HSC English Hub App in Byron Bay or Sydney. Looking forward to seeing you there. I appreciate your generosity. It means a lot to me. This pledge is either a straight donation or it will give you access to the Teachers Area on the HSC English Hub App once the user downloads it. You will be issued with a code once the App is published. You are welcome to come to one of the launches of the App in Byron Bay or Sydney. Woohoo indeed. Thank you so much. This pledge is a donation or it will give you access to any combination of the following to the value of $150: Teachers Area and/or Student Area and/or HSC Hybrid Writing/Study Guide Workbooks (print). You will be issued with a code once the App is published. You are welcome to come to one of the launches of the App in Byron Bay or Sydney. Can't wait to celebrate with you. What a gem you are! Thanks so much. This pledge is a donation or it will give you access to any combination of the following to the value of $250: Teachers Area and/or Student Area and/or HSC Hybrid Writing/Study Guide Workbooks (print). You will be issued with a code once the App is published. You are welcome to come to a launch of the App in Byron Bay or Sydney. This pledge entitles you to join one of the weekend creative writing workshops in Byron in June or October this year. 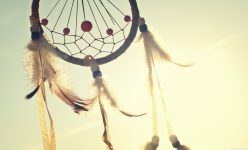 The workshops are about supporting you to take time out to be with the ideas and musings within, giving them space to emerge and delight and possibly even surprise. The workshops will focus on exploring voice in narratives and ways of bringing your writing together into a short story. Feel free to join us for the App launch in Byron Bay or Sydney as well. Wow! From the bottom of my heart, thank you so much. It means the world to me. This pledge is either a straight donation or it will give you access to any combination of the following to the value of $500: Teachers Area and/or Student Area and/or HSC Hybrid Writing/Study Guide Workbooks (print) and/or a creative writing weekend workshop. You are welcome to come to one of the launches of the App in Byron Bay or Sydney. Can't wait. Oh my goodness! Thank you for believing in my product. I'm so appreciative of your generosity. This pledge is either a donation or it will give you access to any combination of the following to the value of $1000: Teachers Area and/or Student Area and/or HSC Hybrid Writing/Study Guide Workbooks (print) and/or a creative writing weekend workshop. You are welcome to come to one of the launches of the App in Byron Bay/Sydney. I'm falling off my chair right now. I'm blown away by your faith in the project. Thank you so much. This pledge is either a donation or it will give you access to any combination of the following to the value of $5000: Teachers Area and/or Student Area and/or HSC Hybrid Writing/Study Guide Workbooks (print) and/or a creative writing weekend workshops for multiple people. You are welcome to come to one of the launches of the App in either Sydney/Byron Bay. What is it? 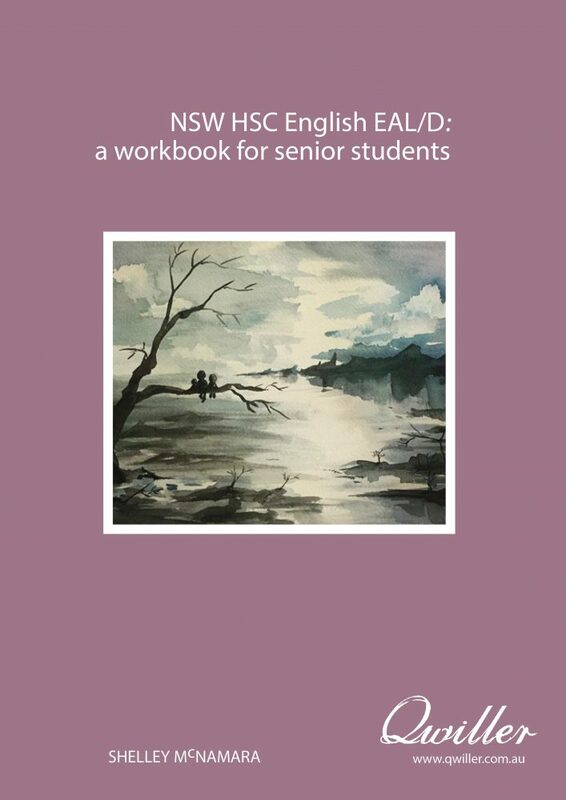 HSC English Hub is an App which gives users access to all resources necessary to successfully teach or undertake various NSW HSC English courses: Standard, Advanced, English Studies or EAL/D. Clientele: All senior students undertaking the NSW HSC English courses, teachers, librarians and parents/caregivers supporting HSC students. What makes HSC English Hub App so special? The App provides Course Information + a Community Centre with special offers and discounts, sample HSC chapters and feedback area + HSC Hybrid Study/Writing Guide chapters, Practice Exams, Revision Summaries and Related Texts Analysis. When is it available? Late August, 2018. I will do my best to publish most of the content on the App by then, but it may take a little bit longer. How can I get a taste of the content? 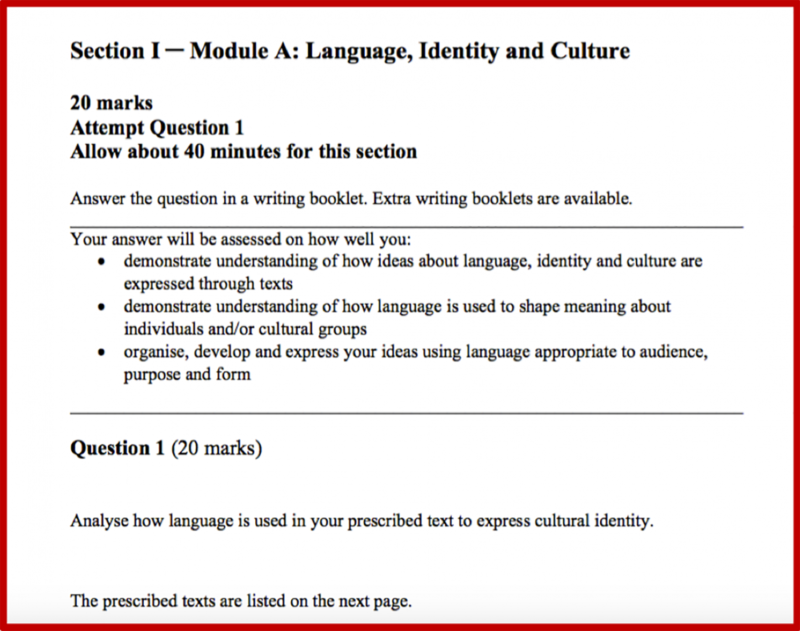 Click here for sample content, including a chapter from NSW HSC English Common Module work ebook, revision summaries & related text analysis. Click here to register your interest and be kept up to date with the App’s progress. See below for more details. Contact: shelley@qwiller.com.au or see http://www.qwiller.com.au/HSCEnglishHubApp for more information. 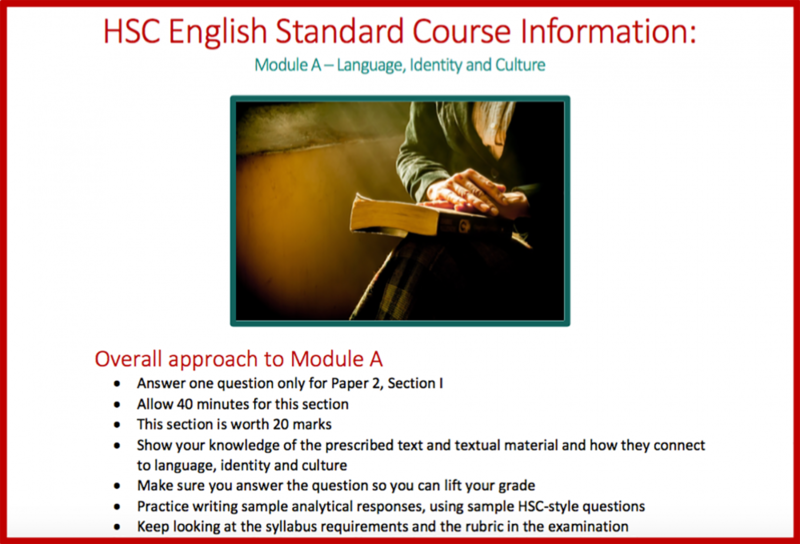 Click here for the HSC English Hub flyer. 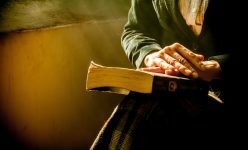 Why an App for HSC English? After having written two batches of HSC textbooks, I was ready to embark on my third go at writing them. 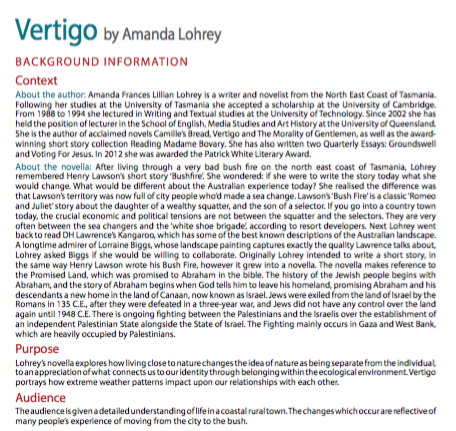 This time I was armed with a whole heap of ideas born from just completing an MA in Publishing at Sydney University. I knew I wanted to do things differently. Not only was I looking for ways of making the content more relevant and user friendly, but I wanted the mode of delivery to better suit the needs of both teachers and students who mostly buy these types of textbooks. Throughout the course, I learned a great deal about file formats, designing print and ebooks and ways of getting the message out there in a busy world. Even though I have just completed the MA, it was my brother’s suggestion that I create an App that got me thinking. I had already undertaken considerable research into what students and teachers were looking for in HSC type textbooks through face to face and online surverys. I had begun to develop reader communities through the creation of free content, such as outlines of syllabus requirements for the new HSC courses and forums for feedback on sample chapters, covers of the HSC Hybid books and general recommendations on HSC English content. So my brother’s suggestion was like a spark of lightning that sent me further down the rabbit hole of all things Apps and how to create them. I love when I keep following the leads, the answers appear, seemingly out of nowhere. There is a guiding light, I’m sure. 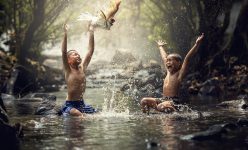 Traditionally, I have followed the guidance of well-established education publishers and sold my books online at qwiller.com.au and through conferences and school orders. However, now you can access certain Qwiller HSC resources on the HSC English Hub App as well. The HSC Hybrid writing/study guide workbooks/ebooks and other resources will continue to be available to be purchased on the Qwiller website and through school orders. I am also very fond of customisation of textbooks and so the App allows readers to download only the resources they need. You no longer need to purchase the whole textbook to obtain access to the content you desire. 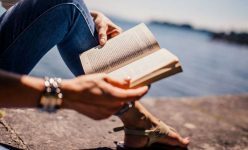 You can ‘build your own’ book by picking and choosing the resources you require to either teach or study a HSC English course, such as chapters from the Hybrid writing/study guides, revision summaries of texts, a range of text material analysis and practice HSC-style English exam papers. You can also come and go from the App and access new resources as the need arises or as I create the content. In other words, the App is dynamic. For example, you might not need a practice exam when you begin teaching or studying the HSC course, but you may later on. 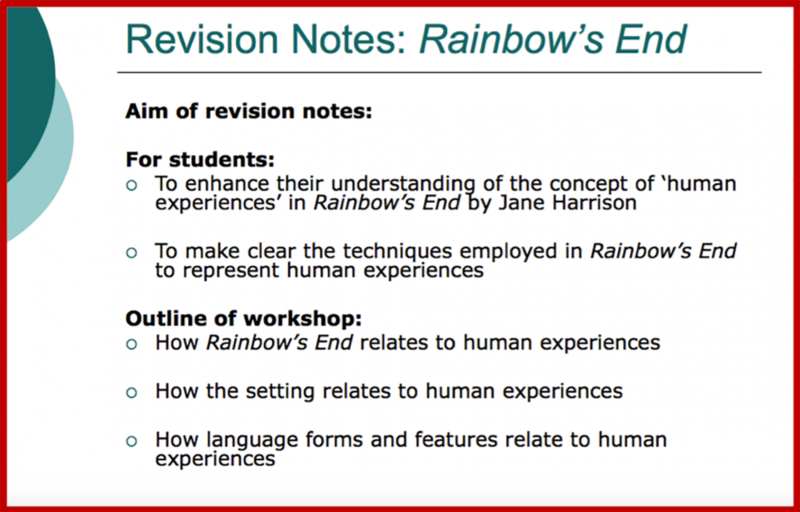 The same goes for revision summaries of texts. In addition, as Apps can be updated, once you download the App, you will be able to keep up to date with new content inspired by reader suggestions and new research. This crowdfunding campaign is flexible. I will continue to publish HSC English Hub App, but if the goal is not reached, at a limited capacity. For example, only an iOS App will be created, but without the additional contracting of writers to create certain content. Your contributions and support can make a huge difference. It’s valuable for me to be able to contract people to help me create the content, rather than doing it all myself. If Apps are not for you, you can still contribite to the campaign by placing a school pre-order and by purchasing the HSC Hybrid Writing/Study Guides Workbooks on the Qwiller website. The print versions of these books also form part of the rewards. Click here to find out more about the textbooks and here to make an online purchase. Click here to download the Qwiller NSW Brochure and School Order Form. Send the form with a Purchase Order Number to secure your copies. I’m also facilitating Creative Writing Weekend Workshops in Byron Bay in June and October this year. These are for all budding creative writers. You can participate in one of these workshops by pledging the Creative Writing Weekend Workshop Reward. If you would like to know more about these workshops, please click here. I’m really looking forward to working with readers to develop the App to meet your needs. The sky’s the limit. 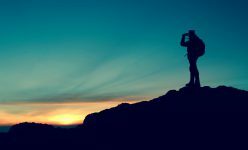 Come and join me on this exciting journey. So what’s on the App? Below is a breakdown of content. 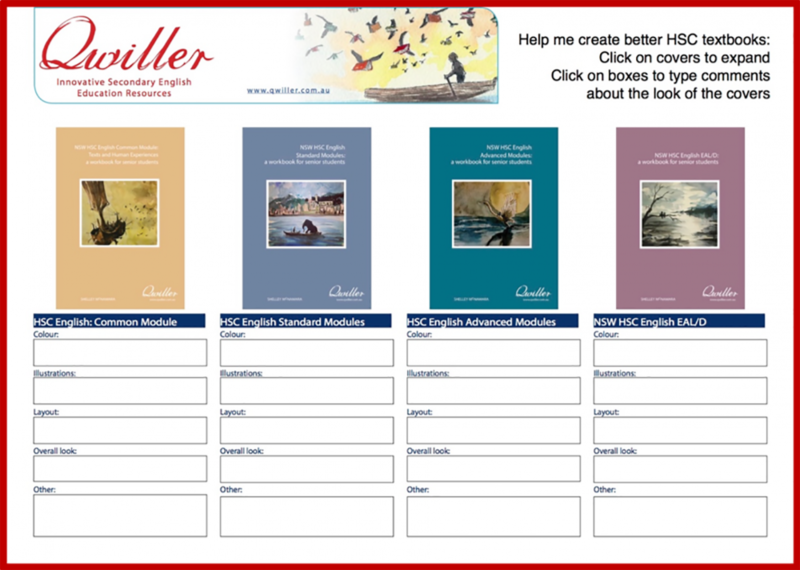 For sample content in draft form, click here to go to the HSC English Hub App page on the Qwiller website. Scroll down to ‘Sample Content’. Please note, all sample content, including the Hybrid Writing/Study Guide covers, is in draft form. 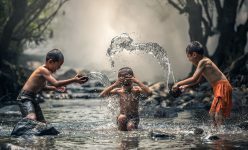 Feel free to comment on the sample content so I can improve the resources before publication. Click here to go to Qwiller’s Facebook page to commment on all sample content. This entails videos of PowerPoint presentations + PDF versions for downloading on the App and displaying on screen. iii. Exam specifications for each course. 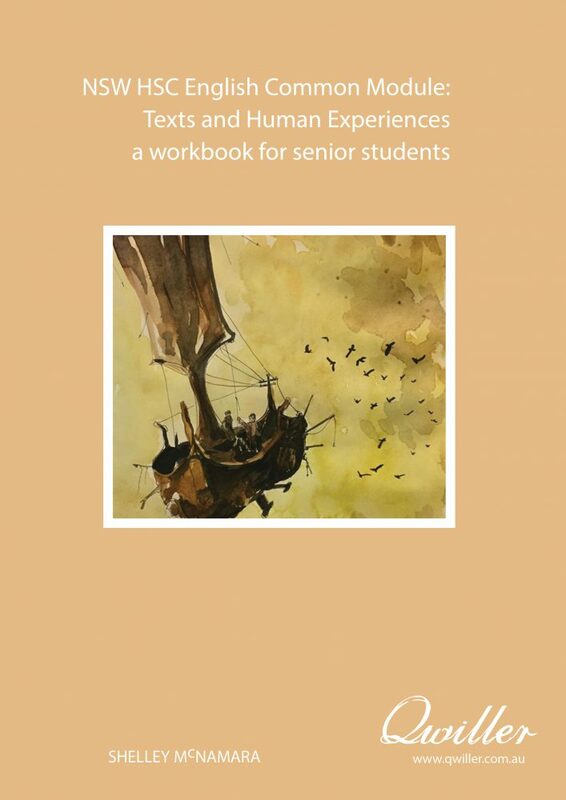 These follow a similar structure to Hybrid Workbook/Study Guide chapters and are about various texts suitable to be used as related texts for the Common Module: Texts and Human Experiences. 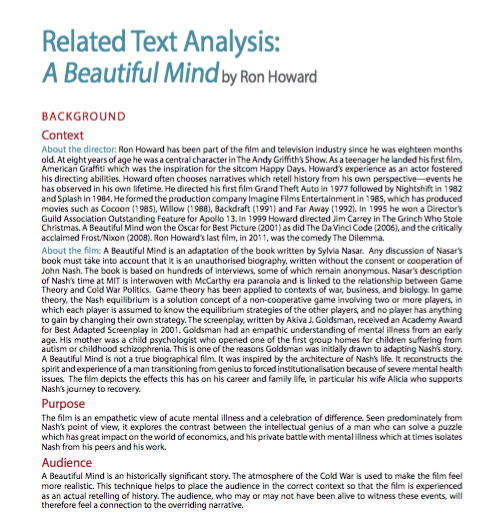 The types of texts include novels, films, poetry, nonfiction and drama. Each chapter includes literary text content such as context, purpose, audience, key ideas, characters, setting and language forms and features. These are similar to HSC textbooks I have written in the past. I’ve just fancied the name up a bit in the hope that their purpose and content is clearer. There are four of these hybrid workbook/study guides to choose from. These print books may form part of your reward. These are on each prescribed text. 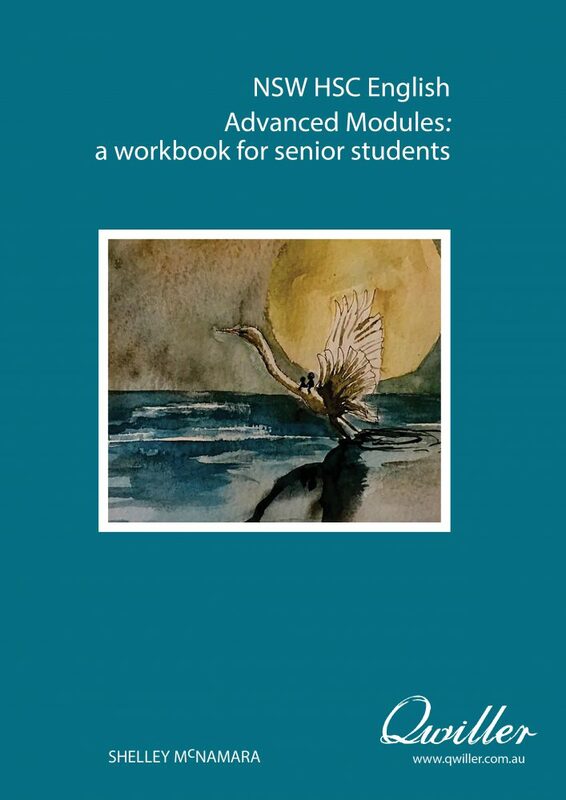 They break down the information in the Hybrid workbook/study guide chapters to assist with revising concepts and ideas in a way that specifically relates to the syllabus requirements. ii. Sample Chapters, Revision Notes, etc. Hiring an App developer is not cheap. 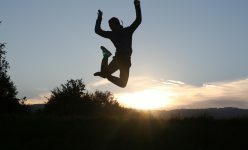 I received quotes from a number of App developers including Lokava, Apps People, Oz IT and Gopi ComX. I also had face to face meetings with Lokava and Apps People. This helped me to fine-tune the App features. It was important to me that the App assisted customers to customise content and display content on screens in classrooms and on personal devices. Equaly important was provision for customers to develop a HSC English reader community through forums and feedback opportunities of not only the resources I create, but the content they require for HSC English. Below is a breakdown of costs for developing HSC English Hub App. – The app will display all content in video and/or PDF files, such as course information, Hybrid Writing/Study guide chapters, revision summaries & sample exams. – Includes offline capability to view PDF resources. – Apple Airplay and Google Chromecast integrated to ‘cast’ screen to a compatible screen for viewing e-books/PDFs and video files. – This includes contracting writers to create PowerPoint presentatons on course information (syllabus requirements and exam specifications) for all courses and all modules + some revision summaries. Below are additional funding goals. I would love for the funds raised to cater for these goals as well. Fingers crossed! My expenses include writing, editing and proofreading all Hybrid Writing/Study Guide Workbooks and most App content, which is estimated to cost $6000 per Hybrid Workbook/Study Guide and $3000 for the App. Permissions can also be expensive and it is estimated to cost $500 per book. ***Pre-orders and sales of each book will contribute to covering costs, such as printing for each book. Printing of the first book to be published is covered in this crowdfunding campaign as an additional funding goal. 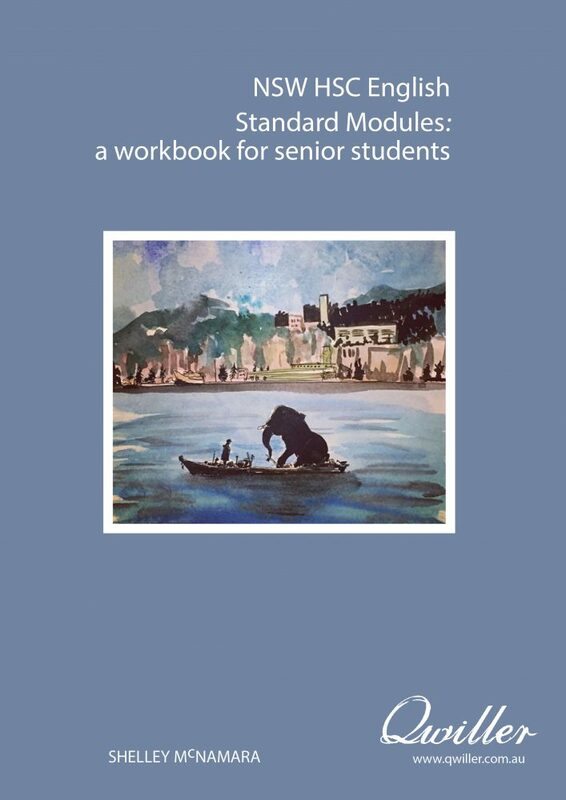 Some content such as Related Text Analysis, Sample English Exams, Class Workbooks on Modules and Revision Summaries have already been written and edited by myself. They require some tweaking to make the content suitable for the app, but this is minimal. However, as I am a self-publisher and in start-up stage, I do not include costs for my time. I hope to add this in the future.